The 2016 real estate market is off to an extreme start! Strong buyer demand due to our flourishing job market and historically low interest rates are the driving force behind this market. Buyers often find themselves competing due to multiple offers which require seller-centric terms in order to win. Prices have continued to grow over the last two years, putting sellers in a very favorable equity position, freeing them up to make the moves they have been waiting for. Additional inventory would help slow price growth and make it less competitive for buyers, creating positive outcomes for everyone. Lending requirements remain stringent, unlike the past “up” market which created the bubble we experienced in 2008. Scroll down for more details about the first quarter market in Snohomish County, south Snohomish County, north King County, the Eastside, Seattle Metro and south King County. 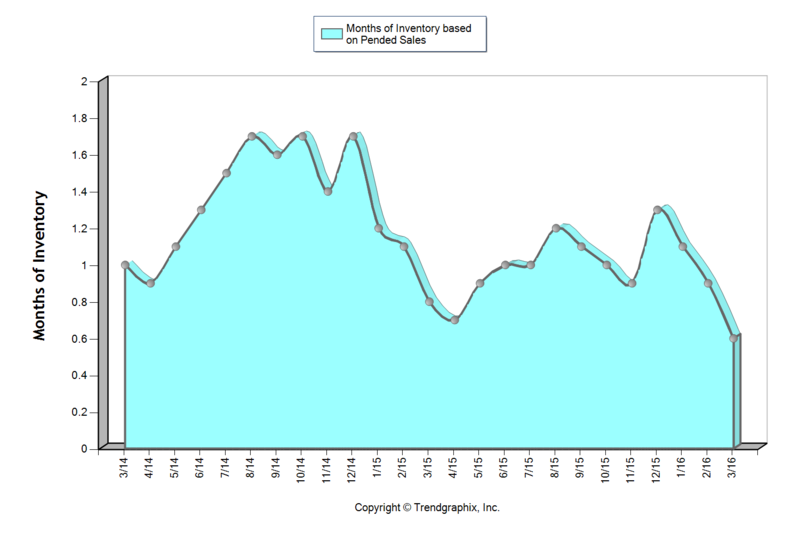 More inventory is needed to quench buyer demand as we head into spring and summer. Snohomish County ended 2015 with a larger-than-seasonally-normal surge of closed sales, leaving us with only 1.4 months of inventory based on pending sales to start the year, which is not much! The first quarter saw a frenzy of buyer activity but only a small trickle of new inventory, leaving us with only 0.8 months of inventory heading into the second quarter. This has caused days on market to shrink and list-to-sale price ratios to rise. These conditions are very favorable to sellers. In fact, average and median prices were up 5% and 4% respectively in March over February! The good news is that new listings were up 25% in that same time frame. We hope to see that trend continue as we head into spring as the buyer demand is there to absorb it and it is needed to slow price growth. South Snohomish County ended 2015 with a larger-than-seasonally-normal surge of closed sales, leaving us with only 1.2 months of inventory based on pending sales to start the year, which is not much! The first quarter saw a frenzy of buyer activity but only a small trickle of new inventory, leaving us with only 0.7 months of inventory heading into the second quarter. This has caused days on market to shrink and list-to-sale price ratios to rise. These conditions are very favorable to sellers. In fact, average and median prices were up 5% in March over February! The good news is that new listings were up 27% in that same time frame. We hope to see that trend continue as we head into spring as the buyer demand is there to absorb it and it is needed to slow price growth. North King County ended 2015 with a larger-than-seasonally-normal surge of closed sales, leaving us with only 1.1 months of inventory based on pending sales to start the year, which is not much! The first quarter saw a frenzy of buyer activity but only a small trickle of new inventory, leaving us with only 0.6 months of inventory heading into the second quarter. This has caused days on market to shrink and list-to-sale price ratios to rise. These conditions are very favorable to sellers. In fact, the average price was up 2% in March over February! The good news is that new listings were up 49% in that same time frame. We hope to see that trend continue as we head into spring as the buyer demand is there to absorb it and it is needed to slow price growth. The Eastside ended 2015 with a larger-than-seasonally-normal surge of closed sales, leaving us with only 1.3 months of inventory based on pending sales to start the year, which is not much! The first quarter saw a frenzy of buyer activity but only a small trickle of new inventory, leaving us with only 0.9 months of inventory heading into the second quarter. This has caused days on market to shrink and list-to-sale price ratios to rise. These conditions are very favorable to sellers. In fact, average and median prices were up 4% in March over February! The good news is that new listings were up 43% in that same time frame. We hope to see that trend continue as we head into spring as the buyer demand is there to absorb it and it is needed to slow price growth. 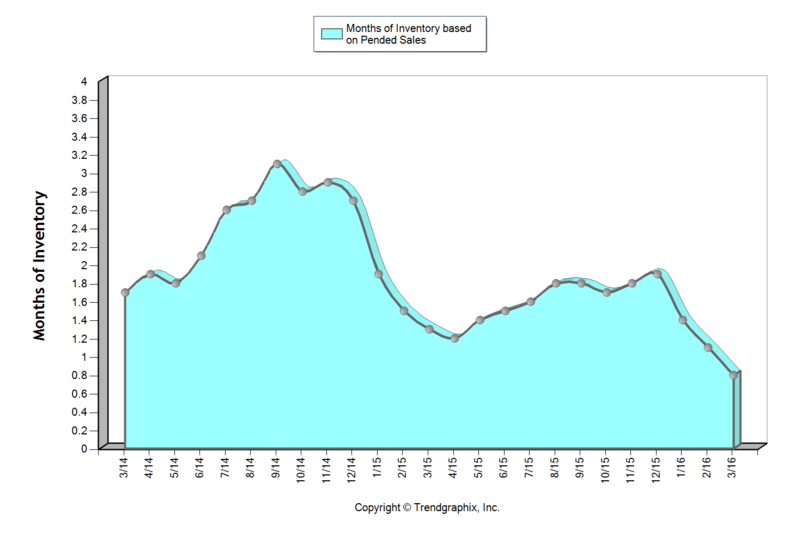 The Seattle Metro area ended 2015 with a larger-than-seasonally-normal surge of closed sales, leaving us with only 1.1 months of inventory based on pending sales to start the year, which is not much! The first quarter saw a frenzy of buyer activity but only a small trickle of new inventory, leaving us with only 0.6 months of inventory heading into the second quarter. This has caused days on market to shrink and list-to-sale price ratios to rise. These conditions are very favorable to sellers. In fact, average and median prices were up 3% in March over February! The good news is that new listings were up 47% in that same time frame. We hope to see that trend continue as we head into spring as the buyer demand is there to absorb it and it is needed to slow price growth. 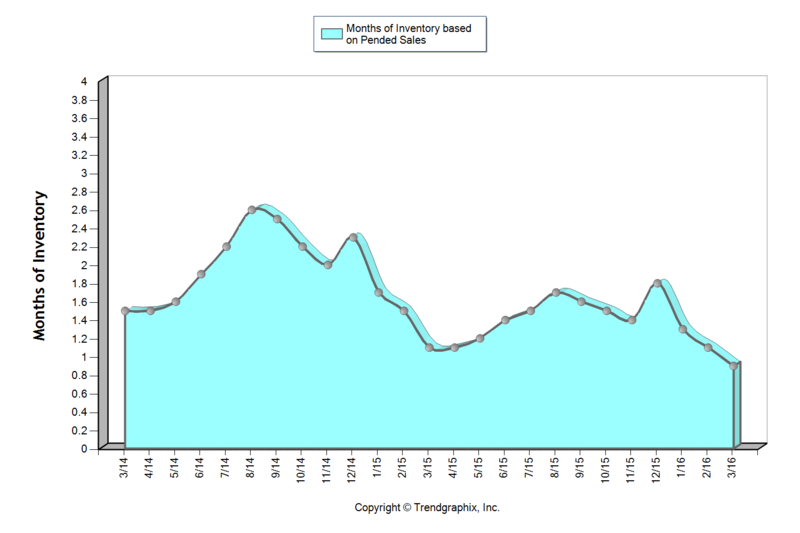 South King County ended 2015 with a larger-than-seasonally-normal surge of closed sales, leaving us with only 1.4 months of inventory based on pending sales to start the year, which is not much! 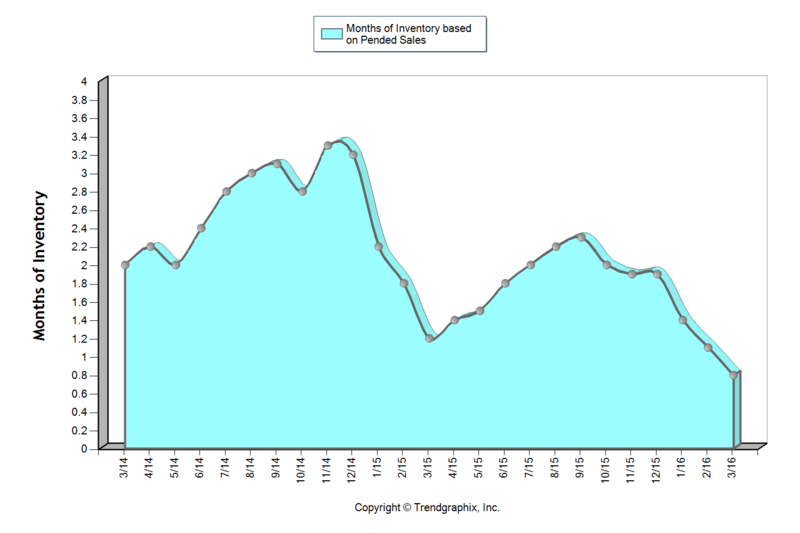 The first quarter saw a frenzy of buyer activity but only a small trickle of new inventory, leaving us with only 0.8 months of inventory heading into the second quarter. This has caused days on market to shrink and list-to-sale price ratios to rise. These conditions are very favorable to sellers. In fact, average and median prices were up 6% and 3% respectively in March over February! The good news is that new listings were up 39% in that same time frame. We hope to see that trend continue as we head into spring, as the buyer demand is there to absorb it and it is needed to slow price growth.